As more of this content comes online, industries such as real estate and insurance will get uglier as commercial players are forced out of the SERP and into buying AdWords. But on the upside, if you gain editorial access to one of these trusted websites it should be quite easy to rank for virtually anything. The Wall Street Journal recently ran an article about SEO and SEM titled In Search of Traffic. I belive you have to be a subscriber to read the whole article, but there is a free podcast interview Kelly Spors did with me about keyword stuff available here, which I think is also available on iTunes. In many formats price is just used to filter out some of the noise, and an item is priced so low remind people it has some value, but allow it to spread fast. Consider Seth Godin's new book titled The Dip. He is a brilliant marketer, has huge reach, has a blog dedicated to marketing that book, and Barnes and Nobles sells the brand new audiobook version for $5. How do you compete with that? Does Seth need to use such a low price point? Nope. He just wants his idea to spread as fast as it can. He creates significant value then gives it away. It gets him more reach, which he can use down the road to monetize any way he wants, from corporate consulting to starting up a network site. Not that Seth would need to do this to get read, but I have seen other marketing experts buy thousands of their own book and give them away so they can make the best seller list. Exposure leads to more exposure, which leads to both trust and opportunity. The web has so much free content on it because the links and attention are so important. If even seasoned marketers near the top of the game are giving away a lot of value you have to give away a lot to gain enough traction to get enough mindshare to make it profitable. I am going to Coachella today. So I should not be around for a few days. I will be around sometime Monday or Tuesday. Or maybe a few days later. My girlfriend loves golf and they have lots of it in Palm Springs. The trip could get extended. Hope to finish an underway ebook update shortly after I return. Lots to think about and sort through with search result re-ranking, editorial algorithmic results, etc. And hope I do not peel too bad from sunburn. Nice to see user generated content getting more political. Google has been progressively eating their own search results with...Google. I hate to use Avril Lavigne as an example, but I am about to go to a sweet concert, so maybe this is ok. Looking at the following searches, notice how Google is promoting Google or sites that are editorially selected and trusted by Google. Their music service promotes trusted resellers, their news service promotes trusted news sources, and their top ranking YouTube pages (promoted externally and internally and algorithmically favored) will eventually consist largely of trusted content providers. If you didn't understand what I was talking about in Google Closing the Window of Opportunity, the above images should do a good job of showing how search is moving away from purely algorithmic to an editorial blend approach, and how Google is making itself a leading vertical search engine in many verticals. The easiest way for Google to be perceived as relevant is to make it easy for other authorities to want to talk about Google as being innovative and relevant. If Google is willing to send significant traffic to trusted sources how could those sources do anything but trust Google? 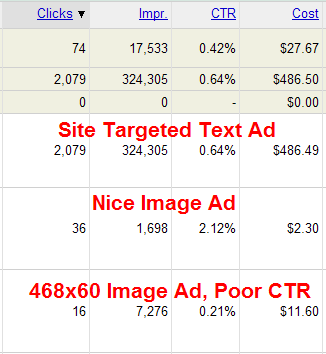 Notice that the 468 by 60 got a much lower click-through rate than the text ad or other image ad. Why? Some of it may have been up to ad positioning, but part of it is also due to 468 by 60 being the default banner ad size. If it looks like an ad people ignore it. Just like the 468x60 banners are being worn out, many sites are selling overpriced 125x125 ad buttons. These are not selling because they offer great value, they are selling because the trend started at a few popular sites, and it is easy for the publisher to ask for a lot without giving away too much value. Low value sites that feature targeted ads as the content (with in content text links) will earn more than high value content which has obvious ad units located in obvious ad spots. If you want to make your marketing successful, leverage techniques that are not perceived as being overused and abused to members of your target market. Rather than formatting your ads like ads turn them into content that is formatted like other content people trust and get people talking about it. Here is an ad unit on a popular category leading hub site. Notice that it is literally below the page footer in the forum section of the site. It is a great site with lots of traffic, but it is hard to profit from that ad unit. If you blindly buy site targeted ads those are the impressions you buy first...the ones that are deemed to have the least value and/or the ones that are hardest to match to a commercial intent. Google's site targeted tool tends to aim for bulk buyers who do not care if they get a bit of remnant garbage inventory. They do not make it easy to add a specific page to a site targeted ad group unless you click the edit sites and CPMs link from a site targeted group, at which point in time you can list individual URLs or folders you want to target. Remember that if you list a home page or root folder page it will also place your ad on other pages from that site or folder. Brian Clark posted an entry about how a common enemy strategy can help propel your marketing and further establish a bond between reader and writer. Effective marketing in a low-trust world means developing a bond with your prospects through your writing. One great way to do this is to share a perceived common enemy with your readers. We are all flawed. If people feel an emotional bond to your words they will trust you and buy from you much easier than if you are selling without any personality. Even if you are not actively selling anything, having mindshare and distribution is important for when you finally decide to sell something. Everyone is selling...their products and services, ad space, their view of the world, their self-esteem, their need for connection, etc etc etc. One of the most effective hate marketing campaigns I have ever seen is John T. Reed's anti-guru reviews. SerpArchive.org looks a bit alpha(ish), but looks like it might be a useful rank checker and competitive analysis tool. The Ask contextual product will initially launch within IAC's own network of sites including Match.com, Ticketmaster, Evite and Citysearch and will then expand to trusted third party publishers. Individual publishers will most likely have to wait until next quarter to gain access to this contextual product. What will they do with ticket scalpers? Currenty they are suing eBay's Stubhub. Once Ask opens up their network to publishers, perhaps next quarter, they will allow you to match your ads for maximal earnings or maximal relevancy. Scott Karp mentioned that RSS has no value without a filter. RSS already has filters, but most people probably do not use them to their full potential. Your top trusted editors in each category already are human editors / filters. As you go deeper into any category you find more duplication. Many blog platforms allow you to subscribe to an individual category. Yahoo! Pipes (and other similar offerings) allow you to mix feeds together. Sites like Del.icio.us, StumbleUpon, and Google Feed Reader allow you to share items with others. Many toolbar providers offer buttons that update with the latest news from an RSS feed. Custom news search feeds and blog link search feeds make it easy to track keywords outside of your favorite editorial channels. Google personalized homepage allows you to create tabs for different news. I have tabs to track SEO, domaining, marketing, general web memes, news mentions and link acquisition of sites I am currently marketing. By paying attention to the people I trust or the people who are voting for my sites I am probably making the votes count more. My strategy for .com domain names has generally been to stash them away and forget they exist. Iâ€™ll take my SEO skillset and go develop the .org or .net cousins to build the exact same audience thanks to the overweighting of exact match in search engines, leaving the .com domains in the vault to appreciate. If you are developing an online brand worthy of attention and can't afford the target .com you probably do not need it. Look how popular Del.icio.us got with their terrible domain name. Eventually they got the .com, but they made that investment after they proved their model worked. Domainers think: "How can I exist without Google .. if Google blew away tomorrow, how could I guarantee traffic delivery?" .. SEO folks seem to think, "How can I get free visits from the top search engine and if that top search engine ever changes, how can I get free traffic from the next top search engine." I don't think SEOs just look at Google for traffic. I think some of the best SEOs think of the web more in terms of the Cluetrain Manifesto, viewing the web as a series of markets and conversations, realizing that if they are frequently talked about then search rankings are a by-product of that. If you are just getting into domains right now and want to develop sites that will get ranked you are far better off buying .org or .net domains, and saving the money the .com would have cost you to spend it on marketing and development of your .org or .net. If you are trying to predict new markets that you expect to become huge you may want to buy the .com. If you want to lock out competition buy all 3 extensions. I went to the city with my girlfriend today. When we ate lunch we were both surprised by how happy the waiter was, then we realized all the waiters were happy. Last night we grabbed a late night snack. We overheard our waiter saying "bus boys taking the tips. need to have their damn thumbs broken." Both waiters were serving food. Why was one group so happy while the other was so sad? The first was in an upscale trendy part of town that likely tips well. The later was at a Denny's that was so sketchy that they even have Brinks security guards at night. When a person is new to business and struggling to get by they will take just about any business they can get, but as they satisfy those needs they move away from things that inspire thumb breaking anger toward things that aid happiness. Who you work with and for is just as important as what your goals are. There is so much so-called SEO out there, mostly outdated, baseless, or downright wrong, that the accessible information is more wrong than right. A Google or Yahoo! search on SEO topics is ridiculous, for many reasons. Often accurate SEO information is considered trade secret by knowledge consultants, and thus is not very accessible. What appears in front of the inquisitive SEO consumer is mostly junk. This puts the prospective SEO client at a distinct disadvantage, and provides an opportunity for the contract-seeking "snake oil SEO salesman" to close a deal at a good profit, often without realistic accountability or other consumer safeguards in place. But, as the 2001 Nobel Prize winning economist George Akerlof showed in his famous paper "A Market for Lemons", asymmetrical information does much more than that. It actual can destroy the market for true, quality SEO. Their is no reason to be surprised at how bad the service selling market is for many SEOs. There are many other markets where the same type of market develops. In some cases it is even a sub-market of the whole that turns to trash. If your main keywords for your target market include discount / cheap / similar buzz words in your market then you might be selling to an audience that is not worth selling to, especially if your product is expensive or your service is time intensive. Last year one of my friends couldn't understand why I was willing to heavily invest into marketing a content site that was barely self sustaining, but any market worth being in will require some level of investment to achieve worthwhile returns. If one off marketing expenses triple your traffic then they allow you to spend more on content quality and develop the site deeper. Many people are afraid to risk anything on a new channel. If you are already spending your time working on it and are thinking about it you are already investing...but investing half way won't get you as far as pouring yourself into a project will. If you over-invest and fail in a few months at least you learn something. If you invest to slowly you might just be burning your time and money without even realizing what is going on. You only have so much time and attention, so it is best to leverage it on a few strong channels. The magazine had been in development for more than a year and had been heavily trailed on TV, radio and the internet. ... Mr Styles said: "Every piece of research we did, every dummy we created and the concept in all its forms was fantastically received from first to last. "The industry wanted it, the news trade wanted it, the market was there according to every group we asked - but come the acid test the readers were absent." They would have been better off launching a website and pouring that print and advertising money into content creation and marketing. That would have been far cheaper and far more valuable than market testing. The web is so easy to track that you can't spend too heavily without getting good feedback quickly. As Google and others continue to close off easy opportunity you can't be afraid to invest if you want to see sizable returns. If you are growing rapidly and already are at self sustaining that is a great sign, because when you get more efficient or cut your development costs that cost center turns into a revenue stream. If you are starting from scratch it is hard to compete with nothing unless you are exceptionally passionate. Google is far from being the top news site, so this allows them to arbitrage the value of the news vertical using their core search results, while still keeping the search results relevant. This allows Google to put ads against their news products, which they have yet to attempt at News.Google.com. This allows Google to funnel more traffic to trusted content sources, and thus help subsidize the content creation costs, while making those sources more addicted to Google's traffic. Overrepresenting fresh trusted editorial content sources in the organic search results gives the organic search results an informational bias, allows Google to start working to depreciate their weighting on fresh blog stories, and lowers the value of small focused commercial sites (unless they are of a high enough quality to get press coverage). Webmasters owning niche or seasonal sites that enjoyed temporal exposure will discover there are fewer traditional top 10 results that are open for the taking, because fresh news stories will fill in a few more slots. In Addition, Google just announced web history, which allows you to search through documents you viewed in the past. Web history will help improve search personalization. If web history also directly becomes part of the organic search results then sites which can afford to spend a lot on advertising will also have another advantage over smaller sites. Many people who took advantage of past inefficient markets are thinking that cheap, free, or social content is the next angle. But the idea is already saturated. Even Tim Armstrong, Google's VP of advertising, launched a thin content play. Andy Hagans has a great post about why the lure is much greater than the potenial rewards. There are new angles to the thin content that add context and value, but those are generally not something that can be leveraged across a portfolio of sites. eHow ranks so well because it was well researched around making money, and gained significant link authority back when it was easier to get links. Given the current market paranoia and the unnatural link patterns on the web it would be much harder to create an eHow today. I think the best way to leverage content would probably be to buy out a unique source that is not monetized to its full potential, like a dying media company. if this book doesn't help me the way i want it (= dramatic increase in traffic as determined at my discretion --- what is my guarantee i'll get my money back? This wanker exposure is not uncommon either. In spite of making my phone number and email address less accessible I typically get to enjoy about 10 to 20 wankers a day. Some I ignore, but even when I try to do that, these people still make my outlook on humanity and the human race a bit bleak. The people buying PPC stuff are already looking to spend money, but many of the people who are attracted to SEO are attracted to it because they are lazy, want a free ride, and refuse to add any value to the world around them. This is exactly why the target market for a PPC book is so much nicer than the target market for an SEO Book. Not sure when I will change my business model, but the sooner the better. What would you do? The more I think about it the more I realize why Google doesn't like the various flavors of paid links. It has nothing to do with organic search relevancy. The problem is that Google wants to broker all ad deals, and many forms of paid links are more efficient than AdWords is. If that news gets out, AdWords and Google crumble. DoubleClick was the wrong model until Google bought them. But smart marketers are not trying to waste millions of dollars on overpriced brand ads. If you are buying ads on Google you are trying to reach everyone searching for a keyword. If you buy contextual ads you are trusting relevancy matching algorithms. Those used to be the standard, but now there are far more efficient ways to reach early adopters. Social influence is far more important than most people give it credit for. People game Digg, draft stories for specific trusted editors, suggest stories to popular blogs, buy reviews on blogs, create products or ideas with marketing baked in, link nepotistically, etc. There are a lot of cheap and affordable ways to reach early adopters. Sure Google likes link baiting today, but that is the next paid link. Google is backing themselves into a corner, destroying each signal of quality they once trusted, until one day the web is a piece of junk or Google is no longer relevant. Ideas come up in the news over and over again, and when they do category leading sites gain self reinforcing links. In industries where many competing sites are viewed as sleazy it is easy to build an industry leading site by playing the industry from the other side. DMOZ loves to list Allegedly Unethical Firms, and so does the media. I just bought a domain name off SnapNames for the $60 minimum. Other bidders must have thought it was worthless because the name matched a scam. It does, but if I create an advocacy website then I have a self reinforcing authority that is a clean link source which can branch out in scope as it gains authority. Every market and every idea is something you can build up or arbitrage against. Sometimes arbitraging against a scam helps reinforce the feeling of self worth in a group of powerful people. As long as you are comfortable with the position, don't be afraid to bet (and build) against scams. It is easier to link at an informational site. There is a huge pool of links open to bloggers that is not open to purely commercial sites. There are people out there who WILL NOT link to commercial sites but will link to content sites. It is also easier to trust a commentator as an unbiased industry source than a person building a new company. If you write things that are link worthy they will spread much more quickly than if they were hidden away deep inside a commercial site. When you write you create connections and gain exposure and trust, all of which can be leveraged to help push your ideas or get feedback on your ideas. If you seem like a fan of your topic it is far easier to access people with competing business interests, before they even think of you as competition. By studying and tracking a topic without committing to any business model, you learn the topic and then can build a business around opportunity. A couple friends recently recommended watching Idiocracy. It is equally funny and disturbing, especially when you consider how our media consumption habits have shifted. Small isolated chunks pretend to be valuable information, but when placed outside of useful context, typically in ordered lists of factoids, they have much more marketing pull than they have actionable value. Some of my better posts go without comment, while some of my lists get thousands of backlinks. Some people have hundreds, thousands, or hundreds of thousands of readers. Some people have millions of inbound links or MySpace friends. Virtually all of it is recycled content and recycled marketing in a fight for mindshare. The struggle for marketing anything beyond thinly disguised self promotion is to be able to add context, all while time starved people learn to hate and reject it, as they rush off to blog the same story before you do. Although I don't read as much literature as I would like to, I have enjoyed Kurt Vonnegut's writing a few times. Cory Doctorow mentioned his passing. Kurt was interviewed here, here, here, here, here, and here. If your goal is to increase conversions such as purchases, page views, sign-ups or leads through your ads, reassess how you're tracking your conversions. Make sure you've implemented conversion tracking so you can understand how individual sites are converting for you. 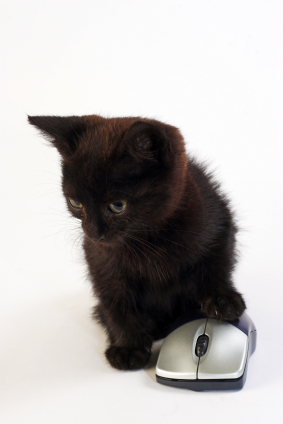 Please note: A low CTR reading on a site does not mean your ads are not performing well. This is because users behave differently on content pages than they do on search sites. Use the site exclusion tool to exclude sites that are not converting for your campaign. Adjust your bids. Enabling our content bidding feature will allow you to bid separately for the content network. Learn more. Identify sites that are converting particularly well for your campaign and take steps to increase your exposure on those sites. We recommend enabling our content bidding feature to bid more aggressively on those sites, or targeting them through a site-targeted campaign. Please note that site targeting utilizes cost-per-impression (CPM) bidding. If you are using CPM site targeting on a large site, but find only a few pages convert, consider just targeting those few pages. Find sources to buy ads from directly, and buy all their ad inventory. Maybe you can even broker a custom ad deal involving presell pages. Find link sources...if they are already selling AdSense it doesn't take much more work to buy ads directly, especially if they are a smaller player and are not making much from AdSense. View what TYPES of content converts and search for other content that matches that intent which you may want to advertise on. View page content to see what keyword phrases the converting content covers. Create content covering the same keyword groups. don't think that you are going to catch them and beat them and STAY RELEVANT by only replicating their links and doing what they are doing. People are creating large networks to try to take down competing sites. People are writing software to estimate the probability of a community liking something. If you don't have enough time to compete on the industrial strength SEO front you can still win by being real and evangelizing your topic. In a few years your biggest competitive threat might not be a direct competitor. It might be a person who loves your topic and just happens to have stumbled into business by selling ad space. Ignore the social aspects of the web at your own peril. It is easy to evangelize some ideas. Here is another meme on why blogging is good and important. Education is great. Everyone should have a chance to be formally educated. I love my God and country. etc. Which brings us to the students - the supposed beneficiaries of this new egalitarianism. For them, the new system has brought debt and degree inflation, since the new degrees are undoubtedly not equivalent to the pre-1990 degrees as measures of ability and learning. They pay more for less quality than their mothers and fathers received and they have little contact with the lecturers because the lecturers are too busy filling out forms and chasing money. This is the Cultural Revolution of the new century and it has left the same desolation behind it. So far, six schools -- the University of Pennsylvania, New York University, Syracuse University, Fordham University, Long Island University and St. John's University -- have agreed to reimburse students a total of $3.27 million for inflated loan prices caused by revenue sharing agreements, Cuomo said. The schools will return money to students who took out loans during the time the revenue sharing agreement was in effect. Students will be refunded based on the amount they were loaned. And that doesn't even take into account that at some univeristies 96% of enrolled students never get a degree. This is why I don't like automation and efficiency when pulled out of context. Eventually efficiency for one party comes at the expense of defrauding anther. If so many schools are actively involved in fraud, how much can a degree be worth? How many other businesses operate with large subsidized hidden costs? 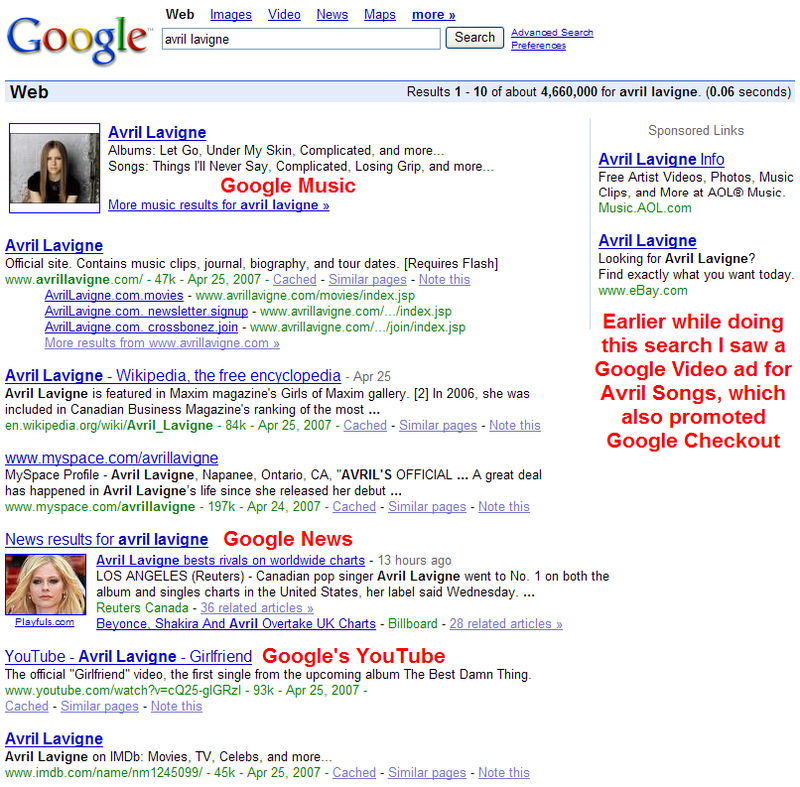 Google sells virtually unmarked ads and The WSJ sells advertorials. And nobody knows why the media is broken. It's not just the internet. When cash and influence rich industry leaders push things so far it forces some people to commit fraud just to keep pace with the marketplace. Yet nobody seems to connect the dots. Why? SEO Question: My site is focused on a small niche and I can't find any related keywords to write content about. How do I optimize my content? What should I do? Answer: Track what you are ranking for and look for meaningful patterns and descriptive related keywords in that data. If few people are searching for something, but you are in a growing field, then that might be great market timing which helps makes you a market leader. Make sure you create things like an industry glossary, and actively participate in communities related to your topic so you have top of mind awareness to people in related fields. Research why people are linking at competitors, and what is missing in the marketplace. If you are already in an established field, then use keyword tools to look for broader keywords or parallel keywords. Observe what descriptive modifiers people are using for higher volume keywords. The odds are pretty good people will use those same type of modifiers when searching for your topic. You can also use this cast a wider net concept by bidding for related broader keywords on AdWords and track the referrals. It doesn't hurt to buy a bit of exposure to get traffic for a new site. If you can nearly break even while buying and selling ads that send RELEVANT visitors to / through your site without making it look cheap, tacky, or untrustworthy you are ahead, because that traffic will improve the algorithmic trustworthiness of your site. I recently launched a new site, and due to a competitive market and various distractions have been slow to rank it. I have been buying low cost exposure, and one couldn't even imagine how many good deals and offers I have got just because the site looks and feels real and is getting a bit of paid traffic. Getting traffic to even a bad site can lead to it being trusted more. I have seen blogs with cheesy designs and roughly a dozen $1 posts blogrolled by experts on spam and related topics that are frequently featured in the mainstream media. Why would they link to it? Who knows, maybe they were in a rush, but as people are exposed to your site and brand some will like it. Exposure breeds exposure, etc. As a marketer there is no reason to hope that quality + free is enough to get your site where it belongs. Spending a few dollars a day can save you hundreds or thousands of dollars in audience building and link building expenses. If you watch TV, the things you see people talking about are what many people are searching for. At Elite Retreat Kris Jones mentioned that he was looking at American Idol for easy ranking opportunities. Yahoo! Buzz posted 5 popular searches for each of the finalists. So I just got approved for Google's pay per action advertising account. It was exceptionally easy to sign up, perhaps frighteningly so. Currently there is little risk to using Google cost per action ads, but long-term I think the risk proposition is much uglier than most people appreciate. I recently did link building for a site where I tried to build links in a stale industry. Many of the people who had top ranked sites did not want to sell links because they were afraid that the links would eventually decay, and they did not want their site to promote garbage. 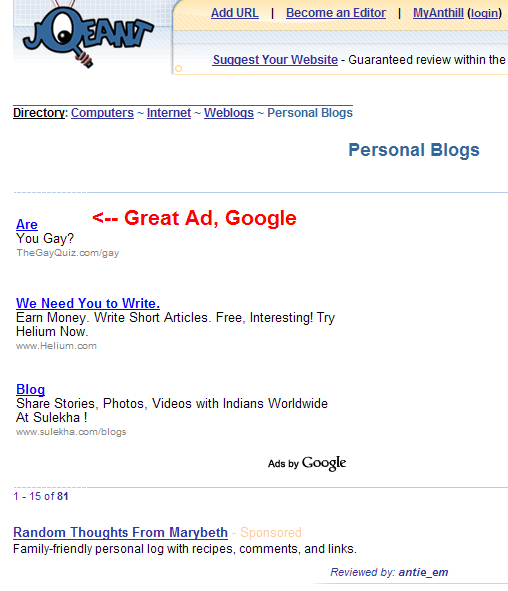 Many of these same sites published Google AdSense ads in the content area. These ads promoted garbitrage, sleazy offers that bombard you with email spam, generic surveys, off topic crap, etc etc etc. And yet these publishers didn't think anything was wrong with it, either because they were unaware of what they were marketing, or because they were not directly connected to it. If you want to do anything online you eventually run into Google, or the effects they have on the web. Google started off with search, which allows them to directly connects with consumers. Their branding, distribution deals, relevancy, and market position have created the fundamental standard of relevancy that all other systems are compared against. It is hard to beat them on relevancy because they have more data than any other company in the world (toolbars, browsing history associated with user accounts, Gmail, AdWords, AdSense, Google analytics, free website optimizer, Google Checkout, cost per action ads, the most popular feed reader, etc etc etc). Even if you did find a way to match Google's relevancy, nobody would notice unless you could match their brand, and overcome the self fulfilling prophecy bias / skew Google's personalization features give searchers. Google makes it easy to publish content and monetize even the worst content in the world. By placing their ads on Warez sites and sites they have identified as spam, they pay people to pollute competing search engines. You can't look at a competitive term in Microsoft's search results without tripping over a .blogspot spam page. Google uses their market position and market knowledge to selectively display the most profitable ads. Consumers are advertised to without the perception of being advertised to. Quality scores support related businesses and trusted allies. Mid-market players make Google's ad relevancy matching engine more relevant. Outlier players do keyword research for trusted businesses until they concede those terms to margin squeeze and quality scores. Due to the ease of implementation and depth of their advertising base, it is easy for new competitors to become an ally, publishing Google AdSense ads, and thus giving Google their usage data. This distributed ad network keeps Google abreast to market trends, allowing them to duplicate innovation, and buy competitors they can't beat. Google cloaks their own content, then sets up quality guidelines for others to follow, which they themselves do not follow. They outsource their flaws on marketers, and tell marketers to clearly identify paid links, all while teaching publishers to blend AdSense ads in content. As Google changes their ranking criterias publishers addicted to the traffic source have no choice but to give Google even more control and authority. Their newest ad unit is an unmarked text link ad, which only displays any ad notification AFTER people hover over the link. Publishers who refuse to sell links directly will publish the ads, and if they spread anything like AdSense does, what happens to links to commercial sites? What happens when virtually nobody is willing to link to a commercial site unless it is through Google? What happens when their affiliate payouts are not high enough to solicit a review? And what happens to those businesses when Googlers decide they want that market for themselves, like real estate? There are two basic ways to do SEO. One is to look for the criteria you think the search engine wants to see, and then work to slowly build it day after day, chipping away doing great keyword research and picking up one good links one at a time here or there. If you understand what the search engines are looking for this is still readily possible in most markets, but with each passing day this gets harder. The other way to do SEO is to move markets. When I interviewed Bob Massa, his words search engines follow people stuck in my head. So what does it mean to move markets? People are using the word linkarati. It wasn't a word until recently. Rand made it up. As that word spreads his brand equity, market position, and link authority all improve. Does that make Rand an SEO expert or a person good with words? Probably both, as far as engines and the public are concerned. I have seen friends get free homepage links from businesses that are making 10s of millions of dollars profit per year. I have had fortune 500 companies contact me with free co-branding offers for new sites. I have came up with content ideas that naturally made it to the #1 position on Netscape and stuck there for 20+ hours straight. I still fail often and have a lot to learn, but I do know this: If you are the featured content on most of the sites in your field then YOU are relevant, and search engines will pick up on it unless their algorithms are broke. When I was new to SEO I did much more block and tackle SEO. I had to because I had limited knowledge, no trust, no leverage, no money, and was a bad writer. The little things mattered a lot. They had to. As I learned more about the web I have tried to transition into the second mode of marketing. Neither method is right or wrong, each works better for different people at different stages, but as more people come online I think the second path is easier, safer, more stable, more profitable, and more rewarding. If you are empathetic towards a market and have interests aligned with a market you do not need to understand exactly how search engines work. Search engines follow people. It is still worth doing the little things right so that when the big things hit you are as efficient as possible, but if you can mix research, active marketing, and reactive marketing into your site strategy you will be more successful than you would be if you ignored one of them. WMW has a good thread about some of the changes people are noticing at Google. Two big things that are happening are more and more pages are getting thrown in Google's supplemental results, and Google may be getting more aggressive with re-ranking results based on local inter-connectivity and other quality related criteria. You need some types of links to have enough raw PageRank to keep most of your pages indexed, and to have your deeper pages included in the final selection set of long tail search results. You need links from trusted related sites in order to get a boost in result re-ranking. Some of those other links may not even be traditional links, but may come from a well placed ad buy. Every unbranded site is heavily unbalanced in their link profile. If you do not have a strong brand then the key people in your community who should be talking about you are not (and thus you are lacking those links). Most branded sites do not create enough content or do enough keyword research to fully leverage their brand strength, but occasionally you see some of them get a bit too aggressive. Many people are recycling and reformatting various ideas to promote them in lists of top 10 xyz's. The problem with formatting them as such is that one can get similar from going to Del.icio.us or StumbleUpon. If you add context to your page, and state why the top 10 things are the best your page is much more linkworthy. Images and formatting matter if you are recycling. Link lists are not as linkworthy as they were a few years ago. Another tip for formatting link lists: if you have a blog on your site you are better off putting your linkworthy content on the blog. Many people check trackbacks. If you talk about them from a static page you have less of a chance of them finding you. If you talk about them on your blog you have another chance for them to find you. I just updated SEO for Firefox again. Now it numbers the search results, and it allows you to sort the results by any of the selected variables. I didn't want the sorting to be obtrusive, so you have to right click on the search results, scroll over SEO for Firefox, then scroll over sort on the submenu and click the variable you want to sort by. The sorting works best at digging deeply if you have your results set to show 100 search results per page. To show 100 search results on Google you would add &num=100 to the address bar of the search result. find the most important internal pages on a site to get a link from. For example, search for site:targetlinksource.com topic, and sort by PageRank, .edu page links, etc. Because I offer a marketing related ebook and blog about marketing stuff I get about 20 emails a month asking me if I reviewed product x or heard of person y. Most of the time these are hyped short lived marketing products or services that are repackaged ideas from 6 months earlier that upsell people on other junk. This is my general review guide on what types of products and services are trustworthy. Are They Getting Paid Directly? If people offer something of quality then most of their referrals are probably going to be more likely from non-affiliates than affiliates. Be wary of products that sound too good to be true, especially if the reviews sound exceptionally similar. Some merchants go so far as to pay people to spam internet marketing forums asking about their products. Are they Getting Paid Indirectly? On some of my other sites I have made thousands of dollars by publishing content on topics I am ignorant about, only because I saw brands spending millions of dollars on advertising and piggybacked on their marketing and brand. Even if a site is using contextual advertising or some other non-direct ad model it does not mean that it should be trusted as non-self interested. In a search and advertising driven Internet world, just writing about popular things brings in money. If their ads are aligned top and to the left in the content area they shouldn't be trusted at all. Even free non-profit content can be shady. Many not for profits pay their CEOs over $300,000 a year, and many people write about topics that grant themselves link equity, mind-share, or authority just by talking about them. John T Reed is exceptional at propping up his own domain via hate marketing. It is much easier to rip off anonymous people than it is to rip off your friends. A person who has spent significant time and effort building their brand and exposure is not going to wildly recommend scam after scam because building their mind-share and brand equity cost them too much to just throw it away. The better you know the person making the recommendation and the more you trust them the more likely they are to be making a good solid recommendation. If two independent friends recommend something then you can probably bet it is worth doing. Two days ago a friend mentioned a name to me and today I saw a mention on a blog I follow. After the second mention I had to have it, with no questions asked. Early SEOs, early AdSense publishers, and early domainers did not get rich by telling everyone to do what they are doing. If something is highly profitable, easy, and scalable why are they selling it? Why not just do more of it themselves? If they are not motivated by profits and just like helping people their site should offer valuable information or serives for free or given away for donations instead of selling all the time. The first version of my ebook was free until I got a bunch of market feedback to help make it valuable. I really didn't care that much about money until I get sent a bogus lawsuit. I still blog a lot because it is an easy and scalable way to gain reach and authority with minimal cost. Others are in far better position than I am and give back a lot, but most of those people are not constantly selling you something. They give just because they enjoy doing so. Some of the early domainers offer great entrepreneurial advice, fund non-profits, and even give living advice. Spam Google and Make Millions While You Sleep!!! You are only $19.99 and one click away from wealth!!! The value of any deceptive technique is inversely proportional to the number of people using it. If a spam idea is scalable and actually works, the profit has to come from somewhere. If an idea is aggressively marketed, works (in a best case scenario...though most of the scams do not), and fills Google or some other large network with spam those networks will fight it off. They have to fight it off or they will lose their trust and market position. This is why companies like Digg have to keep some perception of control to keep their authority. We strongly believe attempts to game Digg are ineffective. While it would be foolish to say that Digg has never been artificially manipulated in the 2+ years (50,000,000+ diggs) we've been live, we're confident that such attempts do not impact the content that reaches the home page. But eventually the market calls them on it if it is a lie. There is a reason the term banner blindness was coined. People learn to ignore even legitimate forms of advertising. If an idea tricks end users then eventually people are going to learn to ignore the noise. That is not to say that there are no shortcuts, but if any single spam tool is widely promoted is going to have a limited lifespan. I generally consider spam to be things that are mass marketed to newbies and appeal to laziness, typically via wording that essentially means something like "secrets formula to unearth unlimited instant profits without passion or effort, guaranteed". Anyone who tells you that all you need is a one page website is probably missing the point of search. Of course it is possible to rank a one page website, but typically only if it is in a non-competitive market, or if that person is well known away from that page, or if that page offers significant value, like some self reinforcing authorities do. Anyone who does not offer any value without squeezing information from you to pound you with an auto-responder is going against the general trends of the web, and the trend for how most people create authority by first creating and sharing value then monetizing. Anyone can grab a couple small samples or other biased statistics, and hit you with them over and over again, but there is no reason to subscribe to that sort of never-ending sales stream. It is even worse if the list is leveraged to hype the same things that are hyped by other JV gurus at the same time. If their information contains nothing but affiliate links to the next big thing then tune out the noise. Real people trying to help you will recommend things that are of low margin or free. Give away value and people will come back. 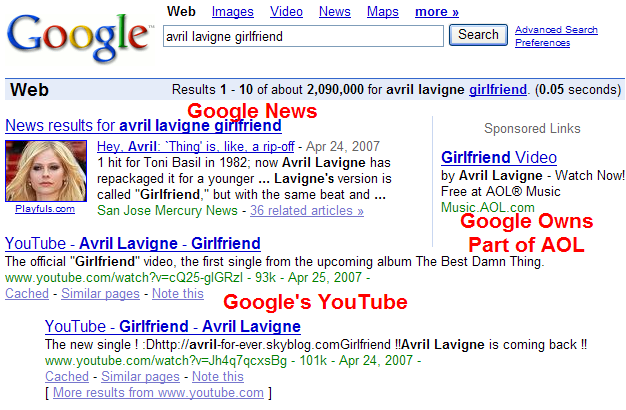 That is what Google does. And it works. Is Email a Better Format? If people allow free subscriptions to email lists, and their content has ANY real value, they would be better off sharing some of it online so they build their link authority and exposure. If you were sharing something that was honestly valuable and decided to make it freely available wouldn't you want as many people as possible to see it? If they send every email twice with slightly different headlines or lots of oops I forgot messages realize those for what they are - aggressive hard sale marketing, not accidents. If the price point is high and you hear next to nothing about a topic right up until many people are hyping it all at once they are probably getting paid an affiliate commission to hype it. Don't buy the hype. A few years ago one well known Internet marketing company tried hard closing me on some mentorship program. After I did the math I realized that I was already making more than my business mentor would be making working under the head guru. Where is the value in a business mentor who uses exceptionally aggressive sales techniques to make less money than you do? Years later the same company who tried hard closing me was blowing up my inbox asking basic SEO questions. Months later they started selling an SEO information product at a higher price point than mine. The web works so well because it is loosely bound. You can get the best pieces of this here, and the best parts of that from over there, often free. If you want to start a blog it is easy to set up Wordpress with a MySQL database (both free). It is exceptionally hard for me to just keep up with the topic of SEO. Any company that has ALL the solutions for you is generally doing you a disservice if you want to be a market leader. Some people sell no cost information products then load them up with affiliate links. If your sales price is all margin there is no need for back-end upsells. I asked my mentor NFFC how many affiliate links was too many to place in a for sale information product. He said 1. What happens when affiliate commissions invade an information product is that the author tends to give you recommendations that run really deep, doing things like recommending smaller pay per click search engines alongside the big players even though the smaller ones have little real traffic and are probably not worth your time. Another problem is friendly recommendations and recommendations of paid products where better free alternatives exist. Outside of UseIt, most authoritative sites generally look aesthetically pleasing, with some unique design elements to them. If a site is ugly then I think that cuts at the credibility of the information, especially if they use hard sales techniques. Look for the same signals of credibility that librarians look for. If you can't tell who is behind a website it is probably a bad idea to buy from it. And if the person who told you about it said it is a secret or for members only, and there is an email subscribe box on the landing page I would not trust them. If they have to use games to garner attention then their stuff is probably a joke. One of the flaws of search is that many current experts are people who own old domains and are still considered experts even if they have not kept up with their topic for years. Just because a document is dated does not mean it is bad, but an old document about a changing field like SEO is going to have a high likelihood of having some bad analogies or advice in it. If you are skeptical of doing something don't do it. When I first got on the web I was lucky enough to meet people like NFFC, read Andrew Goodman's book and learn about Seth Godin, and learn to gain more confidence in my marketing skills. I was also lucky to be able to help set up a Search Engine Strategies conference and get a free pass. If you are lead astray off the start you may not stick around long enough to succeed. But if you find the right mentors they may help you succeed far quicker than you expected. I have friends that have grown faster than I have because they associated with good friends that provided symbiotic marketing opportunities. If your friends and information sources keep learning, keep pushing, and help build you up then you are going to do far better than a person who listens to people focused on maximizing how much revenue they can get out of you, because maximizers will keep selling even after their products stop delivering value, and they are more likely to lead you astray than to help you out. When creating a content based website you can't just look at how big a market is and say thats a lot of money I am gonna go get some of it. You have to evaluate the profit potential of the market, and how easy it is for you to access it. Zillow does well in real estate because they have a unique way of displaying information. If you have a new format / angle / niche you can do well in even the most competitive markets. Many markets that are allegedly competitive have a bunch of thin sites all doing the same stuff. The Forex market has almost no editorial, and the channels that have editorial tend to be so technical in nature that they are hard to cite. How many useful original ringtone sites are there? How hard would it be for someone who had a useful ringtone site to get 50,000 visitors a day? How many markets are there where half of the top results are obviously written by Indians who barely know English? No matter what category you are competing in, you are going to have some minimum baseline writing, design, research, link building, and marketing costs. It is likely more profitable to be an established unique site in a field of sites all offering the same thing than it is try to be a market leader in a market with low search volume and virtually no commercial intent. Every day bloggers and members of the media are looking for stories to talk about. If you are afraid to be associated with and talk about your own projects how can you expect others to talk about it? How can you get people to talk about you as much as they talk about competing channels if you are anonymous? For a long time it was easy to be fake. You could find a few non-competitive markets, buy a decent domain name, buy a custom site design, do good research, get a few good links here or there, etc...but it is getting much harder to do that today. Savvy webmasters are rarely interested in link exchanges with new anonymous sites (especially because they have been getting bombarded with link trade requests for years), webmasters who own sites that have AdSense on them tell you that they won't sell links, and if you buy too many link based advertisements or do other things that fall outside the norm you risk your site getting nuked for being too aggressive. As more people get online you have to connect with or influence more people to achieve the same goals. Each connection takes both time and money. Buying a half dozen trusted on topic links could be a couple day project, whereas a smartly launched content as marketing idea could garner hundreds of natural organic links faster, cheaper, and with less risk. People manipulate search engines because they are trying to get around creating what the engines want. The goal of search engines is not to make manipulation impossible, but to make the cost and complexity of manipulation prohibitive to where it is cheaper to rank by winning the hearts and minds of other webmasters. Search engines show you some data points (like PageRank) but they don't show you which votes don't count, if they are using phrased based semantic relationships, how old sites or links are, how fast things have grown, etc. etc. etc. As relevancy criteria moves to things you can't see it is going to be hard to be fake and amass enough trust to rank without tripping over some filter or penalty. If you have to hide your identity or be something fake your number of profitable days online are numbered, and you will be missing out on publicity that your competitors use to eat your market position. And there is an even worse factor that plays into the demise of anonymous sites. Those who are getting publicity can be more aggressive with their link buys and other forms of marketing without needing to worry too much about how the engines will perceive it. Google is more concerned with your ratio of legitimate marketing to shady stuff, and it is getting hard to have enough power to get to the top of the results while staying above board if you do it anonymously. Wikipedia ranks #2 for Aaron right now. They also rank for millions of other queries. They don't rank because their information is of great quality, they rank because everything else is so bad. About.com was once considered best of breed, but scaling content costs and profitability is hard. Google doesn't hate thin affiliate sites because they are bad. They only hate them because the same thing already exists elsewhere. Search engines try to benchmark information quality, and create a structure which encourages the creation and open sharing of higher quality content. When you see poor sites at the top of search results view it as a sign of opportunity. Realize that whatever ranks today is probably not what search engines want, but it is what is considered best giving the lack of structure to the web and how poor most websites are. Currently domain names carry significant weight in Google's relevancy algorithms if they match the search query, but that is a signal destined to lose value. As more people get into automated and cheap content to turn park pages into automated low cost community driven sites, search engines are going to learn that it doesn't make sense to give a matching domain default status in a category. Frank Schilling, a well known domainer, recently blogged about how to unseat Google, and is using wiki content to seed community driven sites on generic domains. Two ways Google is fighting off the automated content generation that domainers will explore is through duplicate content detection and minimum PageRank requirements on a per URL basis. Domain names are trusted because they are an expensive commodity largely controlled by a few people, and most of those people are not developing the names. Once those people start turning parking pages into content sites I think search engines are going to need to look for other relevancy signals. Many VCs and domainers have been looking at automated or low cost development ever since Paul Sloan's 2005 article Masters of their Domains, but a search engine full of sites like eHow, WeHow, and WikiHow is not a search engine that is useful to searchers. Topix is aiming to be citizen driven, but opens up new markets using an automated blogging technology called RoboBlogger. The Wall Street Journal, which called blogging overhyped rubbish, recently started producing advertorials. Their CollegeJournal site links to Scholarships.com sitewide, and provides a co-branded scholarship search on CollegeJournal.com. How will Google minimize the media's ability to sell advertisements that rank in Google as though they had editorial value? They are going to have to start breaking sites and search results into pieces. If they do, it will not only minimize the downside potential of advertisements on popular sites, but that would also kill the .edu spam. Personalization will lower the profitability of leveraging off topic broad nationwide ads by lowering their exposure by biasing search results to locally trusted sources. Matt Cutts has talked about personalization recently, not once but twice. Given that some domainers control millions of daily page views, and there are plenty of cheap traffic sources I don't think raw usage data will be that strong of a signal of quality. Like links, usage data is easy to manipulate. As the web gets polluted with low cost links, other low cost marketing opportunities, and recycled junk the key to Google's success is tracking attention data. They have the most popular feed reader, and their new homepage allows you to create topical tabs that show related feeds. In tracking how people consume and share information they can understand local topical networks, while reinforcing the views of the local topical editors. It sorta creates a bunch of micro-Digglike communities, but more free-flowing, with less focus on free votes. Time is the one thing we are all limited on, and if you are paying attention to something then there is a lot of value in trusting that attention. Domain Name: Can you do well with a bad domain name? Of course you can short term, but long-term if your business name is hard to remember you are going to lose market share to people who have a more memorable domain name. I am not suggesting that everyone runs out and spends many thousands on their first domain name, but if your domain name is hard to remember, or people will not accept donations from your site because your domain name looks spammy, it is time for a change. Credible Site Design: The logo on SEOBook.com cost $100 and the design on SEOBook.com cost $1,500. Both are probably worth at least 10 times that much. I started off with a default design and then bought the $100 logo, then eventually bought a nice site design. In many markets the market leader is determined by people outside the topical community. A beautiful site design makes it easy to vote for you and trust you. Credible Content: If you are afraid of a manual review of your site content by a search engine then your site is not a sustainable site that will stay relevant. If nobody talks about your site you are losing marketshare. Link Equity & Marketing Strategy: Editorial links come from conversation, which is often driven by marketing. What makes your site remarkable? If you are mainly ranking due to site age and old links, what can you do to keep your site relevant to the current market? Are the linkarati interested in your site? Profit Strategy: Some sites are directly monetized through advertising, services, or product sales. Some sites are tools to build credibility and indirect revenue streams. Some sites have other nepotistic values such as a clean link source or a connection to the media. Many of the best sites start off as a hobby and move into biz model. Every market worth being in changes quickly, and every business person starts off with an imperfect business model, and then uses market feedback to move toward being more efficient. Google originally was designed as a project to measure the most authoritative links on the web and then they transitioned into being a search engine. Missing any of these pieces is just like monetizing via off topic pop ups, or other strategies that have moved into irrelevance. Google made the link an ad unit because people won't be able to ignore it. A site can be successful with only one piece of the value chain done well, but if you fill in the gaps in the other parts of your site profile the profits will be much greater. If one is spread too thin working on too many projects it is easy to lose marketshare, but if you work hard on a few sites you are passionate about and listen to market feedback it is easy to quickly become a market leader. What other things did I miss? What do you think is an important element in successful sustainable websites? Selling your stuff on either of those networks might be a good way to leverage their domain related trust to rank in the search results, but you can also use both of them to research what is worth selling or writing about, even if you do not sell on their networks. Since their research data is conversion oriented, in many verticals it is worth more than keywords from other sources. eBay offers a Marketplace research service that costs $2 to $25 a month. Amazon shows which products are the best for last year, current top selling products, movers and shakers, and hot new releases. In addition to giving away this free conversion information, Amazon lets you see what customers think of the product via review, allows you to bid on keywords related to products via ClickRiver. If you sell your stuff on Amazon.com, you can buy a better together listing with a popular product. If you are in the info-product market Clickbank's Marketplace is a goldmine. Once you find interesting products you can refine your keyword research using general keyword tools, then further refine that data by using a tool like KeyCompete to see what keywords competitors are bidding on.